This sweet little cat can talk up a storm, keep you entertained with her playful antics and curl up on your lap to give you loads of affection. Meet Olive! 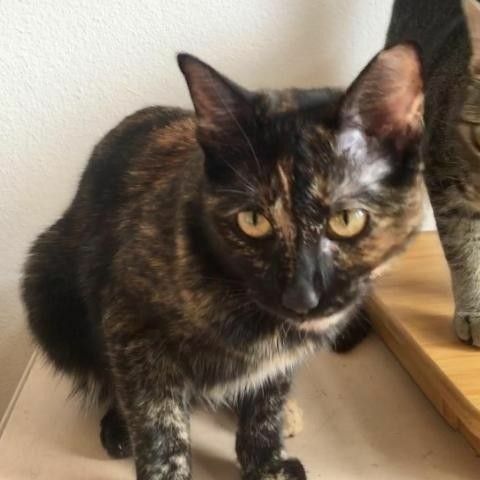 A spritely, young black and brown Tortoiseshell/Mixed, Olive is full of life and looking for her forever home. It might take Olive a while to get used to you, but once she overcomes her initial shyness she will become a playful, affectionate companion who will follow you around the house and even greet you at the door in the evening! She's described by her foster as easygoing, loving and curious. Her favorite activities are carrying her toys around and chasing them all over the place. You're sure to be entertained by her antics:) When this little cutie is ready to relax, she is more than happy to curl up next to you on a chair or a bed. When she's into serious relaxing, she can be found kneading her special blanket, especially if you are underneath it to get a kitty massage. We think she's one loving cat. Do you think you could make Olive the newest member of your household? Olive would love a FUREVER home with somebody who will love her and become best buddies with her. Do you think Olive would complete your family? If so, apply to adopt Olive today! This pet is available for pre-adoption or completing their foster care with their adopter, as he/she is undergoing medical treatment. If you are interested in learning more, apply now and one of our Adoption Counselors will discuss the options available so you can bring home your new furry family member! All Dallas Pets Alive adoptable pets are spayed or neutered, microchipped, and up to date on vaccines upon adoption. The standard minimum donation for cats over six months to seven years is $100, kittens under six months is $150, cats eight years and over are $50 unless specified otherwise. You can view all the adoptable pets and fill out an adoption application online on our website at http://dallaspetsalive.org/adopt/adoptable-cats/ . For more information, you can email adopt@dallaspetsalive.org.